NEW 2Pcs Universal Car Bumper Spoiler Rear lip Canard Diffuser wrap angle Shovel Decorative Scratch Resistant Winglet-Black. 2x Universal Rear Bumper Spoiler Canards Diffuser Car Side Fin Scratch Protector. "USA Standard Gear Spool --. Type : Mini Spool. USA STANDARD GEAR – SPOOLS. Spline count : 28. Condition : New. Therefore all implied warranties that may apply to your part are limited to the duration of this written warranty. 8' Ft. (2.43m's) Std. Get RhinoLip'ed®! RhinoLip® Is NOT A "TAPE" INSTALL! RhinoLip® Hates The Scrape As Well As The "Tape" (A "Tape" InstallDoesn't Work)! All Copy-Rights & Trade-Marks are the Property of the respective Owners & are strictly reserved. 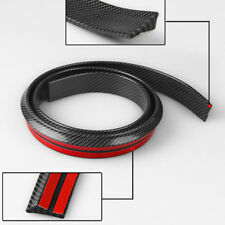 Style: 1x Carbon Fiber lip valance(3M tape attached, just peel and apply). Peel the backing off of one end of the lip. Position the tape sothat the lip is protruding towards you. Install on the underside of thebumper starting at one end of the bumper. From Autopartstoys Online you will find a selection of superior quality Ground Effects unequaled anywhere! We are available to be your supplier of this quality line of RAZZI GROUND EFFECTS. Plastic Material. Simply Fail & Fall Off. The ONLY Way To Get. We Vigorously Defend "Item Not As Described" Cases Because??. Given The Chance??. Hardly Any-One Dislikes Product #2. Rhino-Lip Bumper-Guard. Not Every-One "Gets" Or Likes It, We Understand That. 4pcs Carbon Fiber Front Bumper Canard. Automotive Spoilers Wings Carbon Fiber Front Bumper Lip Splitter Fins Body Spoiler Splitter Side Skirt Roof Spoiler Air Vortex Generator Diffuser Shark Fin. [Color]: 3D Carbon Fiber Style. 1Pcs Car Spoiler. Black Wireless Shark Fin Style Auto Car Roof Radio AM/FM Signal Aerial Antenna. Position: Car Spoiler/Roof/Hatch Gate/Trunk/Bonnet. Flexible enough to conform to different types of car body. RhinoLip® Hates The Scrape As Well As The "Tape" (A "Tape" InstallDoesn't Work)! Simply Fail & Fall Off. The ONLY Way To Get. We Vigorously Defend "Item Not As Described" Cases Because??. Given The Chance??. Simply Fail & Fall Off. LOTuS's, Corvettes, Jaguars, Porsche's & Other Muscle Cars Types Need 9'-10' Ft /2.74m's-3.04m's. 8' Ft. (2.43m's) Std. The ONLY Way To Get. We Vigorously Defend "Item Not As Described" Cases Because??. 1pcs Universal Mini Spoiler. Material: Carbon Fiber. Universal fits for all car models. Material: High quality carbon fiber rubber. Color: Black carbon fiber. Look forward to see you soon. What is a spoiler made of?. How do I install a rear spoiler?. Detailed manufacturer installation instructions are included. In general use supplied locater tabs to mark where the spoiler is to be installed, drill and attach. High-quality material protective layer, anti-scratch, protect the trunk door sill from scratches. 5cm 2.5m Door sill scuff plate. Bend freely. Protect the bumper from rubbing and break the paint, making the car more beautiful. 1986-1989 Buick LeSabre 6th Sedan models. Durable yet can be easily bend to the curves for the best results. Hover to enlarge image. Car 58cm Bumper Spoiler Rear Lip Side Skirt Extension Splitters Winglet Wings. 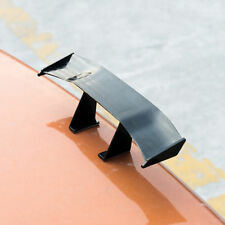 2PCS Car Side Skirt Rocker Splitters (Left Right). Use double side adhesive tape or drill holes and bolt on to your bumper (double side tape or bolts are not included). 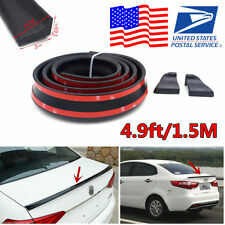 4.9ft/1.5M Universal Black Soft Car Rear Roof Trunk Spoiler Wing Lip Trim Sticker Kit. 1Pcs Car Spoiler. Material:High Quality Flexible and Durable PU Material. Position: Car Spoiler/Roof/Hatch Gate/Trunk/Bonnet. ●2 x Front shovel decorative. Application :Car universal. Detail Image. Colour: Black. 2pcs front shovel. We will respond within 24 hours and give you a satisfied solution. 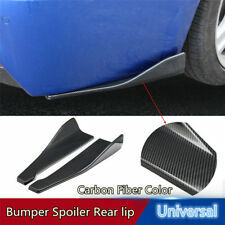 2Pcs Winglet Type Style Carbon Fiber Color Front Bumper Lip Diffuser Splitters Canard-2610. Color:Carbon Fiber. Custom fit most vehicles, product may require drilling holes and apply bolts to attach to your bumper. 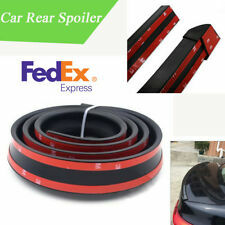 1Pcs Car Spoiler. Material:High Quality Flexible and Durable PU Material. 10Pcs ABS Air Vortex Generator Diffuser Shark Fins Wing Kit For Car Roof Spoiler. 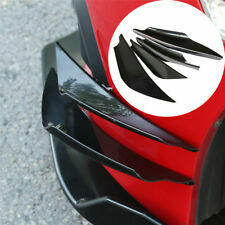 10X Carbon Fiber Surface Air Vortex Generators Roof Shark Fins Spoiler Wing Kit. Improves the Exterior Appearance of Vehicles in Genuine JDM Style. Wing Width: 21.5cm (Max Distance) / Rack Width: 22cm / Rack Height: 17cm~23cm (Adjustable Rack Tall). On the other hand. whatever that can make you happy. 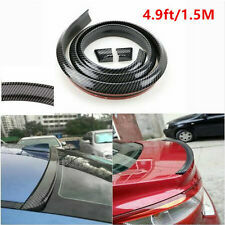 2pcs 3D Carbon Fiber Car Rear Bumpers Spoiler Rear Lip Canard Diffuser Anti-scratch. - Color: 3D Carbon Fiber Black. 2 x Rear Bumper Spoilers. - Quick way to add a spoiler/lip to any car for an cool and sporty look. Simply Fail & Fall Off. Well, Because! Check & See Of We Have A Fellow RhinoLip® Re-Distributor In YOUR Country (Just Ask Us!). 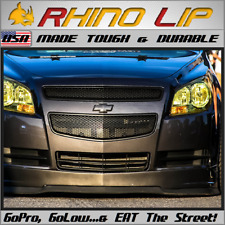 Rhino-Lip Bumper-Guard. Not Every-One "Gets" Or Likes It, We Understand That. Simply Fail & Fall Off. All Copy-Rights & Trade-Marks are the Property of the respective Owners & are strictly reserved. Unauthorized use is prohibited. Given The Chance??. Hardly Any-One Dislikes Product #2. Improves the Exterior Appearance of Vehicles in Genuine JDM Style. Wing Width: 18cm (Max Distance) / Rack Width: 17cm / Rack Height: 17cm~23cm (Adjustable Rack Tall). On the other hand. whatever that can make you happy. 2pcs front shovel. Excellent Team Work. Excellent R & D team. Competitive Price. You will find a large selection of high quality automotive accessories. 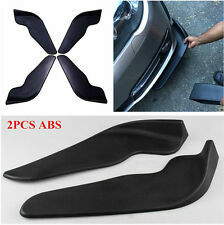 2Pcs Winglet Type Style Black Front Bumper Lip Diffuser Splitters Canard-2610. 2Pcs bumper splitters. Custom fit most vehicles, product may require drilling holes and apply bolts to attach to your bumper. Product specifications: 150CM (can be cut). Product color: pure black. We have warehouses in the USA, CA, and AU. Improves the Exterior Appearance of Vehicles in Genuine JDM Style. Wing Width: 9cm (Max Distance) / Rack Width: 17cm / Rack Height: 17cm~23cm (Adjustable Rack Tall). On the other hand. whatever that can make you happy. Wing Width: 21.5cm (Max Distance) /Rack Height: 17cm~23cm (Adjustable Rack Tall). Improves the Exterior Appearance of Vehicles in Genuine JDM Style. On the other hand. whatever that can make you happy. NEW 2Pcs Universal Car Bumper Spoiler Rear lip Canard Diffuser wrap angle Shovel Decorative Scratch Resistant Winglet-Black. Universal Rear lip Bumper Spoiler Canards Diffuser Car Side Fin Scratch Great. Universal Foam Rubber Front Bumper Lip Spoiler. The Lip Splitter is made from flexible foam rubber allowing it to conform to virtually all vehicles and trucks. Our lip splitter can be applied to any front bumper, and can withstand any weather.